A RUP LIFE: Local News for Philly Pa area!! Guy's Grocery Games looking for Contestants! Local News for Philly Pa area!! Guy's Grocery Games looking for Contestants! 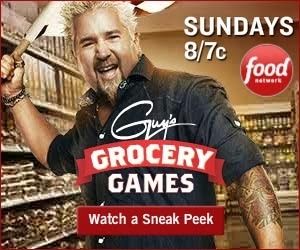 Guy’s Grocery Games, hosted by best-selling cookbook author and successful restaurateur Guy Fieri. The show, which premiered on Sunday, October 20th and will continue to air on Sundays at 8pm ET/PT and 7pm CT, is set in a grocery store where four talented chefs compete against each other through three cooking challenges, as they must navigate their way through the aisles adhering to a number of “real-world” culinary challenges to create tasty dishes. The chefs must rely on their improvisation, gamesmanship and culinary skills for a chance to win up to $20,000. The local challenge will take place on Wednesday, November 6 1:00PM at ACME, located at 3590 W Chester Pike, Newtown Square, PA. Four local contestants will be given up to three challenges to test their shopping and culinary expertise. The winner of the local challenge will receive $1,000. A Rup Life was provided press for this post.